Not a lineup change, but a wardrobe change for the Proteas. South Africa released their first kits under their new sponsorship with New Balance on Wednesday. The Boston, Massachusetts-based apparel company will outfit Cricket South Africa for the next five years. As for the kits themselves, they are a breath of fresh air after a number of years with Adidas. 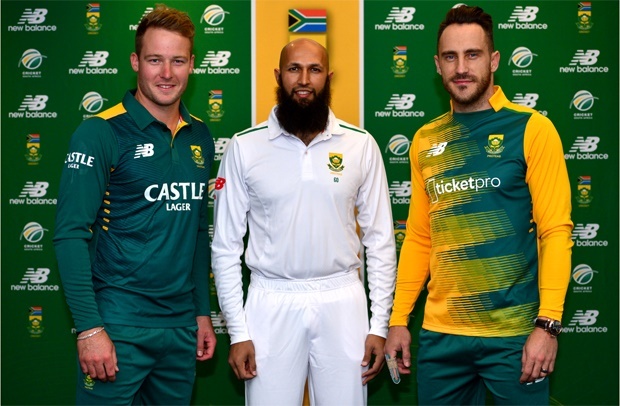 David Miller, Hashim Amla, and Faf du Plessis were on hand at the launch to show off the three different kits for the various formats. For the ODI kit, New Balance have picked up where Adidas left off using the darker green that is similar to that of the Springbok kits and equally as striking. It appears that Castle Lager have moved there logo on the ODI kits to a more prominent placement across the chest similar to that of India’s kit with the Star sponsorship. Hash showed off the Test whites which are straightforward enough though they incorporate a bit of green on the shoulders to make them stand out relative to other Test nation sides. The T20 kit is well…a T20 kit. It isn’t as bad as some (looking at you IPL). The dark green matches that of the ODI kit which is great to see, hopefully spelling the end of that light green that the Proteas have worn for far too long and the high collar is a bit of a neat look. Interestingly, Castle Lager appears not to be sponsoring this kit, instead that honor goes to Ticketpro. All in all, a very nice lineup put out by New Balance for their first ever Protea kits. Here is to hoping the men perform in Bangladesh as good as they will look. Well, it didn’t take too long for the good feeling of the Proteas World Cup run and #ProteaFire to come crashing down. Just after the semi-final loss to New Zealand there was noise that Vernon Philander was selected over Kyle Abbott because of racial quotas. Cricket South Africa and Sports Minister Fikile Mbalula were quick to deny that there was any type of racial quota being observed in the selection for the match. Mbalula has reiterated his stance that quotas played no part in Philander’s selection on Monday.